When the 18th Amendment to the Constitution took effect on January 17, 1920, New England’s taverns suddenly became speakeasies. Law enforcement couldn’t keep up with the new law, honored more in the breach than the observance. Many old New England homes, drugstores, restaurants and shops turned into speakeasies. They made it easy to find beer and liquor. You could get alcohol on the sly in hotel basements, in curtained restaurant nooks, in bars that straddled the Canadian border and in commercial buildings turned speakeasies. 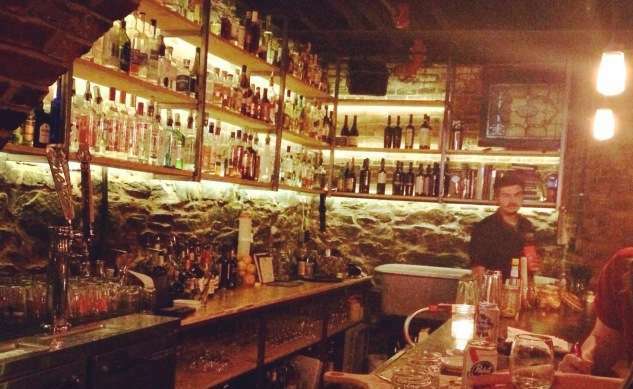 Here are six former speakeasies in New England you can now visit – and in five of them, you can order a cocktail. Legally. If you know of others, please mention them in the comments section. TK’s American Café, Danbury, Conn.
One of Connecticut's many speakeasies. Connecticut did not ratify the 18th Amendment, and it didn’t take long to realize how many people flouted it. People could easily get booze from rumrunners or stills within the state. By October 1921, the state Prohibition director estimated Connecticut had 1,500 speakeasies, with 400 in New Haven alone. Speakeasies flourished in Danbury as well. TK’s American Cafe, which started as a car dealership in 1928, became a speakeasy. With the repeal of the Volstead Act, it became the Hat City’s first legitimate bar. 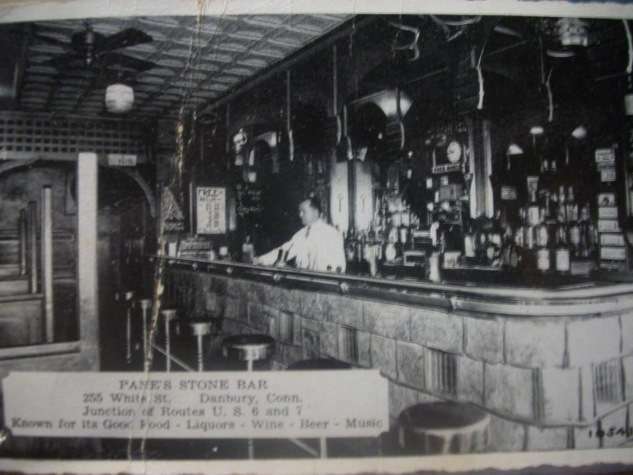 Called Bennie Pane’s Stone Bar, it morphed into Pane's Restaurant in 1937 and served the first pizza in Connecticut. In 1948 it changed hands, and would change hands again and again. Tom Kennedy opened the old speakeasy as a sports bar in 1990, and struggled to keep it afloat until he offered 10-cent wings on Tuesday nights. Patrons say it hasn’t changed much – except for the televisions – since Bennie Pane owned it. T.K. 's American Cafe, 255 White St., Danbury. Bramhall, then a speakeasy, now a tavern. Since Maine was the first state to outlaw alcohol, Mainers were the first to flout the ban. The rest of the country didn’t learn from Maine that banning booze drove drinking underground and promoted crime. Taverns turned into speakeasies, bootleggers smuggled spirits over the Canadian border and rum runners brought them in by sea. Immigrants made and sold alcohol from their kitchens, and farmers made it from secret stills. The Old Port District, then as now, was a haven for the thirsty public. The Congress Street bar now known as Bramhall was a Portland sanctuary favored by scofflaws during the wild days of Prohibition. A dim, brick-lined stone vault with little natural light, Bramhall bills itself as a modern speakeasy. For years it was a basement pub under The Roma Café, now defunct. Bramhall has been refurbished and reopened with a reasonably priced menu. 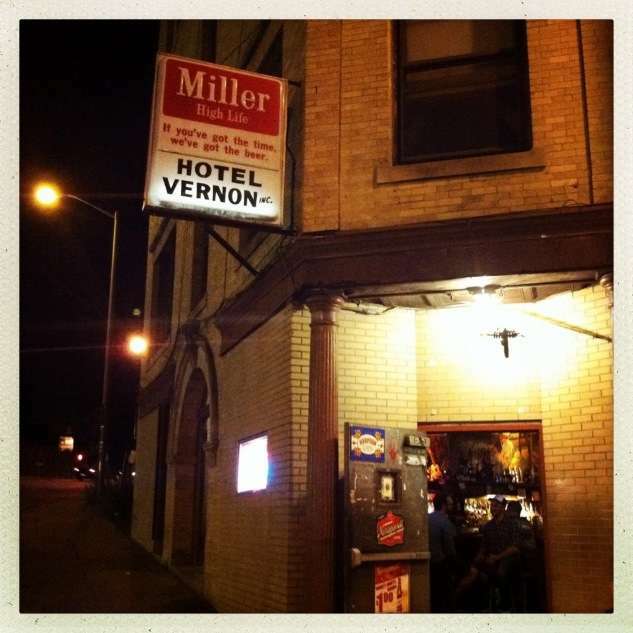 Worcester had plenty of speakeasies like the Hotel Vernon. On the eve of Prohibition, Jan. 15, 1920, Worcester celebrated the death of John Barleycorn with raucous partying. Celebrants jammed saloons and hosted parties in hundreds of homes. Most establishments stopped serving liquor at midnight if they hadn’t run out already. But the party kept going surreptitiously throughout the city, including and especially at the Hotel Vernon on Kelley Square. Two brothers owned it, Frank “Bossy” McGady, a state trooper, and Beaven McGady. Down a long wooden staircase the hotel served liquor at its hideaway speakeasy, where no one ever got caught. It had a secret entrance and a password, “Madame Rhubarb,” to get through it. Babe Ruth often stopped in for a drink or four. The construction of I-290 transformed the neighborhood, not for the better. The Hotel Vernon became a residential hotel and dive bar. Today you can get $1 drafts, free peanuts and a tour of the speakeasy in the basement if the bartender isn’t too busy. Hotel Vernon, 1 Millbury St., Worcester. The Cave, Bretton Woods, N.H.
A Cave in the mountains of New Hampshire. Liquor was still legal in Canada and times were hard in Northern New England during Prohibition. People therefore had a strong incentive to smuggle alcohol. Bootleggers brought in illegal booze from Canada along the dark, unguarded wooded roads crossing the border into New Hampshire, Vermont and Maine. 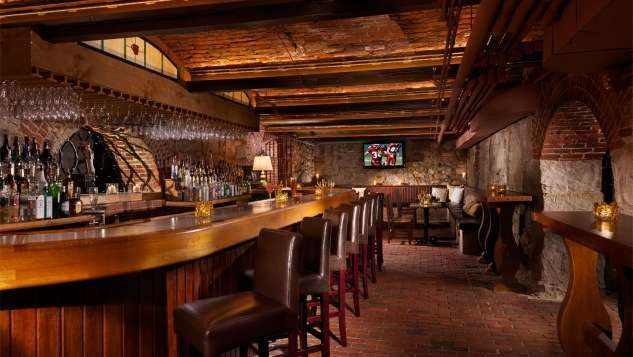 Boston’s elite enjoyed surreptitious cocktails in The Cave, a subterranean vault in the cellar of the Mount Washington Hotel, which famously hosted the Bretton Woods Conference in 1944. Patrons drank booze out of teacups. According to legend, Joseph P. Kennedy sold bootleg liquor to the hotel, now known as the Omni Mount Washington Resort. The Cave was originally set up as squash courts. During Prohibition, the hotel turned them into a speakeasy with a pull-down false ceiling. In the event of a raid, an alarm sounded, the booze would be stuffed in the ceiling and a game of squash would hurriedly start. Cave is now open from 9 pm to midnight with a late-night menu, televised sports and occasional entertainment. Mount Washington Hotel, 310 Mount Washington Rd., Bretton Woods, N.H.
Rhode Island had plenty of speakeasies, including Camille's. Camille’s Roman Garden opened the year before Prohibition as Marconi’s, after the pioneer of long-distance radio transmission. It spent its first five years on Atwells Avenue. Then it moved around the corner to a 19th century mansion on Bradford Street near the entrance to Federal Hill. Rhode Island, like Connecticut, didn’t ratify the 18th Amendment, and, like the rest of New England, it pretty much ignored the ban on spirits. Camille’s put curtains on the private alcoves that ring the dining area. Behind those curtains, patrons drank booze made in the cellar. 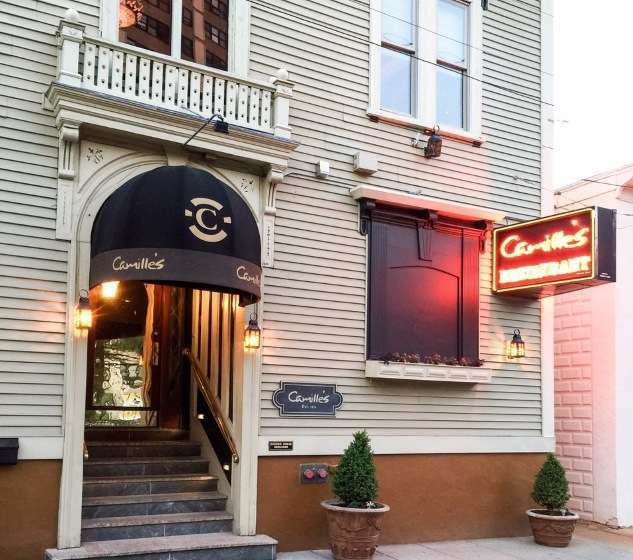 Camille's has the distinction as the oldest continuously operated restaurant in Rhode Island and the second oldest family-owned restaurant in the United States. The owner sold Camille's in 2001, and expected the buyer to demolish it. Instead, the buyer renovated Camille’s and now serves fine Italian food. 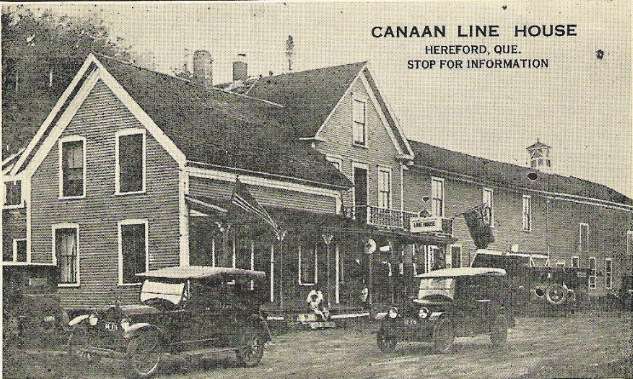 Camille’s at 71 Bradford St., Providence, R.I.
Canaan Line House, Canaan, Vt.
Speakeasies were especially easy to find on Vermont's border. Vermont never went dry, it went damp. Rumrunners routinely supplied booze from Lake Champlain and from over the Canadian border. It used to take an hour to get through St. Albans because so many people were drinking in restaurants, which either had booze in the back room or advised patrons where they could get it. Bootleggers and people seeking a good time at the line houses routinely jammed traffic. Queen Lill’s Bucket of Blood in Richford was just one of the many line houses that dotted the Canadian border. The line houses straddled the border between Vermont and Quebec, often with a front door in Vermont and a bar in Quebec. One of the most well known was the Canaan Line House, on the border between Canaan and Saint-Herménégilde, Quebec. Today it’s known as the Canaan-Hereford Road Border Crossing. The abandoned remains of the old Canaan Line House sit between the Canadian and U.S. Customs stations. You may also be interested in this story about Prohibition here. This story about speakeasies was updated in 2019. Great article! My family and I have visited TK’s! Might have to take some mini road trips. Well, they got it wrong. Nikola Tesla was the inventor of wireless. How about The Rathskeller in Charlestown, RI? The walls even have original, restored paintings of Prohibition era boxers. In the main dining area I noticed what looked like a false window (really a door) that had a little plaque over it is stating what may have been the silly password to gain entry ( the word escapes me). This place is in the middle of the woods, perfect location for a speakeasy! Terrific food and beer selection, too. I know it’s off topic, but I thought the oldest continuously operated restaurant in RI was the White Horse Tavern in Newport.